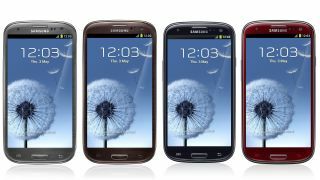 Hold on to your hats people, the Samsung Galaxy S3 will be arriving in the UK in a range of brand spanking new colours in just a few weeks time. As you'll be unable to contain your excitement any longer, we'll get straight into it, the new colours are: Titanium Grey, Garnet Red, Amber Brown and Sapphire Black. The grey is exclusive to the Samsung Galaxy S3 LTE on EE's (formerly Everything Everywhere) new 4G network which is set to roll out in the coming weeks, while the red will be taking up residence at Carphone Warehouse. The red version of the Galaxy S3 is already available across the pond in the US, with network Verizon laying claim to the firey offering, while the black Galaxy S3 has been rumoured for a while and we've now got official confirmation – with an arrival pegged for "later this year". And of course no colour palette is complete without the customary brown… well ok, maybe we could do with out this particular shade, but hey it will probably appeal to those who wear crocodile shoes and neckerchiefs – niche exploited. Anyway, you'll soon be spoilt for choice as Pebble Blue and Marble White come but a distant memory as Samsung looks to tackle the multicoloured mobile onslaught from the likes of Nokia.